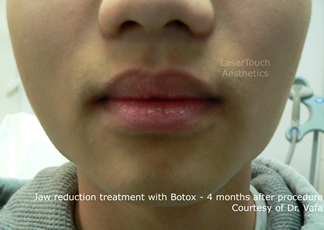 how does jaw reduction or slimming with Botox work? This procedure reduces the appearance of a wide jaw line caused by Masseter Muscle Hypertrophy (or enlargement). 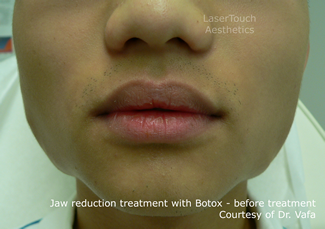 The careful injection of OnabotulinumtoxinA (Botox) in the Masseter/chewing Muscle weakens and reduces the size of the muscle resulting in a softer angle to the jaw and a more pleasing facial shape. We typically see three types of patients in our practice. The procedure is performed by Dr. Vafa frequently on patients concerned with the shape of their jaw or jaw muscles. Bruxism is a condition in which you grind and/or clench your teeth. The patient may unconsciously clench their teeth during the day or clench and/or grind them at night while asleep. In some patients bruxism can be frequent and severe enough to lead to jaw disorders, tension headaches, facial pain, damaged teeth and many other problems. There are many causes of bruxism however the most common are: anxiety, stress, tension, frustration, hyperactive personality type, and other sleep problems such as sleep apnea. Dr. Vafa is considered a leading expert and one of the first to treat Masseter Muscle Hypertrophy and Bruxism with OnabotulinumtoxinA (Botox) injections in New York. He has performed thousands of procedures and has been involved in several studies regarding the treatment of bruxism with neuromodulators such as Botox. 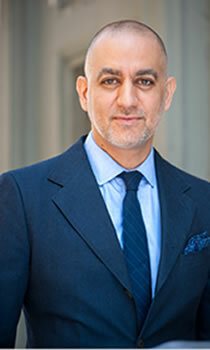 He is also an educator who has taught the nuances of the procedure and injection technique to other doctors in the field. 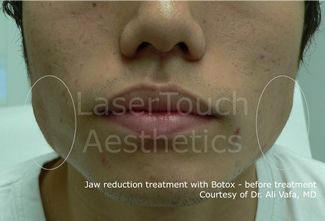 Who is an appropriate candidate for the Botox Jaw Reduction or Botox for Bruxism? Dr. Vafa will be able to best assess your candidacy during a complimentary consultation. However generally any person who has an excessively wide jaw line due to large chewing muscles (who would like to slim his/her face), and any person who suffers from Bruxism, is a candidate for this procedure. 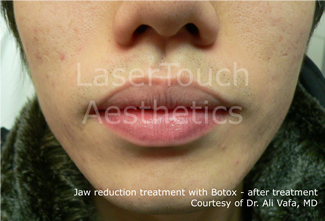 How does Botox for jaw line reduce the size of my jaw line and help with Bruxism? When Botox is injected into the muscle it partially relaxes it. Underused muscle eventually loses its mass and reduces its overall size. The reduction in size will also cause a reduction in the ability to clench and grind in patients who suffer with Bruxism. As with any procedure involving needles, there is a small chance of mild bruising or mild transient redness at the area of injection.